This northern approach to Silver Star Mountain via a trail called Ed's Trail, is one of the most beautiful hikes in the Gifford Pinchot National Forest. The trail head is at the end of Forest Road #4109. The hikes up Silver Star Mountain almost all follow old road beds that were in place for logging and for access to the fire lookout facility that used to be on the top of the mountain. This hike is a partial exception to that rule. The begins a moderate climb and after a couple switchbacks follows one of the old roads for a short distance. Then the trail leads away from the road bed and becomes a stand alone trail referred to as Ed's Trail. 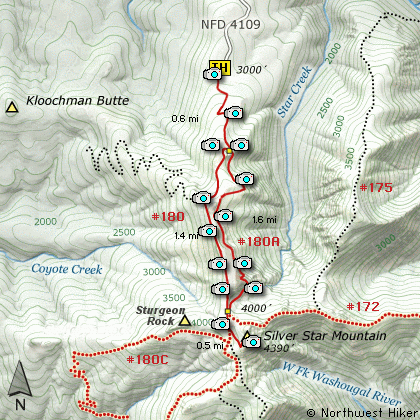 Ed's Trail is a delightful hike up the east side of the Silver Star Mtn ridge line. In June this hike is a floral garden. Anytime the weather cooperates you have exceptional views of the Cascade Volcanos, such as Mt St Helens, Mt Rainier, Mt Adams, Mt Hood, and even Mt Jefferson. This trail runs parallel to the road bed trail that you can use on return for variety. At times the trails are only a few hundred feet apart. Ed's Trail takes you along the east side of the ridge and through a free standing arch. Right after the arch, the trail becomes very steep and challenging. However, it never seemed dangerous to me. At about 2 miles this trail connects with the road bed trail that will take you to the summit of the mountain. As you approach the top you will notice that Silver Star appears to have 2 summits. The one on the north is obviously the higher. Both summits are worth the time and effort. After feasting on the vistas and floral displays, you can return on the alternate route via the road be trail that takes you back to the original trail where you began the hike. Travel north from Battle Ground, WA on SR503 for approximately 5.6 miles to the Lucia Falls Road. Turn right and follow this road for about 14 miles east to the Sunset Falls Road. Turn right and travel east on the Sunset Falls Road for 2 miles, where it intersects the Dole Valley Road. Turn right onto the Dole Valley Road, and cross the East Fork of the Lewis River and head south for 2.4 miles. Turn left onto Forest Road 1100 and follow it for about 6.6 miles until it intersects Forest Road 4109. Turn right onto FR 4109 and follow it for about 1.8 miles to the trailhead for various hikes up Silver Star Mountain.